Increasingly I find myself drawn to time-lapse photography. The inner geek in me seems to revel in the technical aspects and there’s something about creating a moving narrative that I find really compelling. 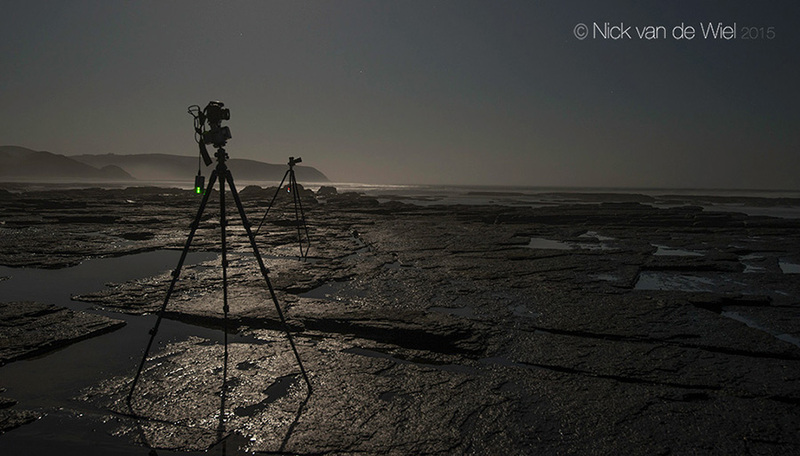 As such, I have enjoyed using tools like the Triggertrap which have made creating time-lapses really simple. I noticed when the CamRanger came out that it too offered time-lapse as a setting, but the cost and the fact that it didn’t offer me anything that I couldn’t already do kept my interest to a lukewarm state. That changed when I heard about the CamRanger PT-Hub & MP-360 kit. The companion video to this review is available on this link: https://vimeo.com/126256722 The video is shot to demonstrate what the CamRanger and MP-360 Head are capable of producing. One of the more complicated aspects of time-lapse shooting is adding movement to a clip. You can artificially add movement by importing a high resolution clip into your video editor and creating a crop that you can pan across the frame. This works quite well considering that many DSLRs are creating images with up to 7000 pixels along the long side of the frame (36mp cameras like the Sony A7r and Nikon D800 et al). Even 4K video only requires a long side of 4096 pixels. This means that if you are shooting with a camera with a 24mp sensor you still have 2000 pixels of movement in the frame. The problem with this approach is it can look quite flat. Real camera movement shifts the actual perspective. This is why there are a plethora of dollies and motorised heads for the video industry that allow smooth camera movement. Time-lapse is a little more complicated in that the physical camera movements between frames have to be extraordinarily small (hyper-lapse excepting). This does mean that if you are wanting to add movement into a time-lapse you have to carry considerably more equipment; to whit a motorised slider and/or panoramic head. That’s what the CamRanger PT-Hub & MP-360 kit offer. A motorised panoramic head that gives 360º of swivel and 30º of tilt (15º up and 15º down) and weighing it at 907g. Now my interest was piqued, so I got a hold of The Sunshine Company and asked if I could borrow a kit for testing. 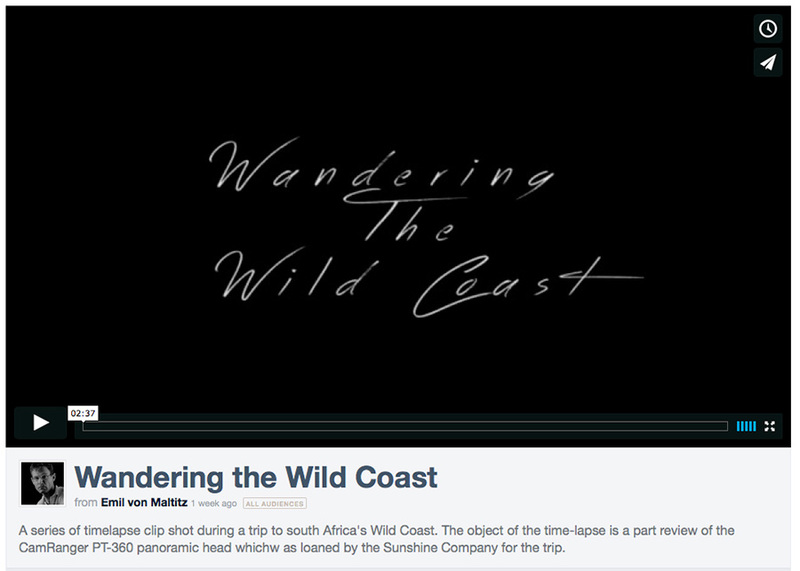 They were good enough to allow me to take it on a recce trip of the Wild Coast (so long as I promised not to be too rough with it…like dropping it in the ocean for instance). I felt quite special when the unit was practically hand-delivered by Willem from Sunshineco. on a visit up to the Durban area. He ran through the features but to be honest I lost him once he unwrapped the actual CamRanger itself and started pointing out where all the various cables went. He disappeared back to Cape Town and I was left with a small rectangular case holding the head, CamRanger, a bunch of cables and some batteries. I have to admit it looked daunting at first. Thankfully there’s a decent manual available which made the setup somewhat easier (thankfully the manual is included in the app as well! brilliant thinking). Once you do a dummy setup it becomes pretty simple to connect all the right cables and set up the unit for shooting. The MP-360 head with a Nikon D800 and 20mm f2.8. The glowing green light is the wifi light on the CamRanger Unit - the tilt movement is the last clip in the companion video. In the background is a Nikon D3x with a Triggertrap attached shooting a star trail. First off, the CamRanger is actually a wireless modem that gives a Nikon or Canon camera wifi abilities. Essentially, plug a USB cable into the USB port of your camera (USB 2 or 3 depending on the camera) and the files can then be transmitted to a device, be it a computer or a mobile device. Most important, is the wireless control that the unit offers. Through a free app you can control just about all of the camera’s settings from focus through to exposure and even quality and colour settings. This opens up vast opportunities for remote imaging. The problem of course being that the camera itself is stationary…unless you add the CamRanger PT-Hub & MP-360. The hub and head have to go together, the hub essentially communicating the controls from the CamRanger unit. A single USB line runs from the CamRanger to the CamRanger PT-Hub. A second USB line goes from the CamRanger PT-Hub to the camera and a thicker round lead runs from the CamRanger PT-Hub to the MP-360 head. 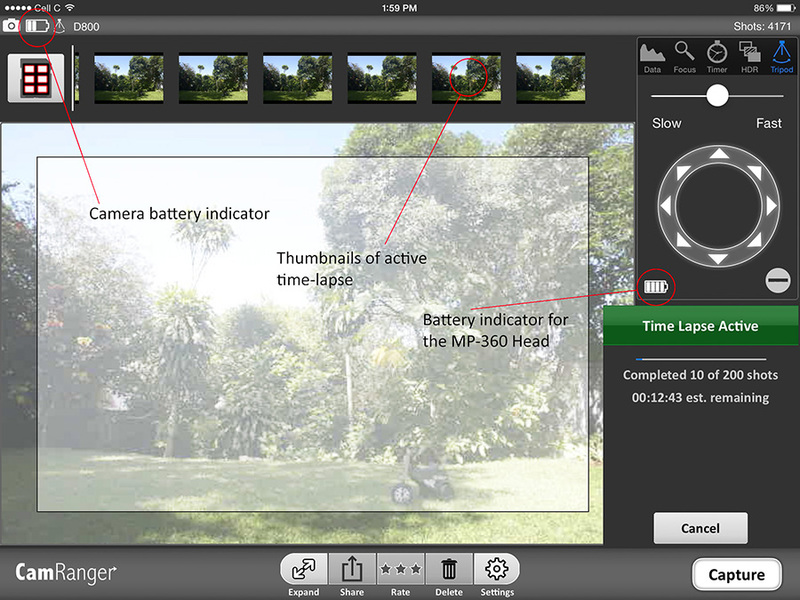 The CamRanger app then gives options to control both the MP-360 head as well as the camera itself. 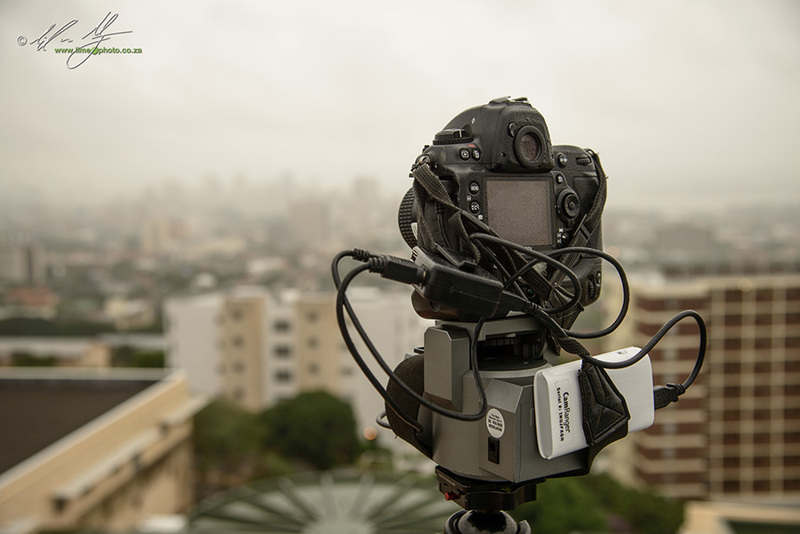 The MP-360 with Nikon D3x attached overlooking Glenwood and Durban. The CamRanger is tucked up with the camera strap to try and avoid any jarring due to wind. Neither the CamRanger nor the CamRanger PT-Hub & MP-360 kit are intended for severe abuse. That much is clear when you handle it. There are very explicit instructions in the manual that the CamRanger should under no circumstances get wet. In reality this is really a wifi modem that has been pressed into service as a camera accessory. Still, the CamRanger unit seems relatively compact and durable, so I suspect that it would be okay if it fell from your tripod, but might not withstand accidentally being trodden on. The MP-360 also has a plastic casing that doesn’t inspire “Desert Storm” kind of durability. So neither the MP-360 nor the CamRanger are exactly bombproof. Where the CamRanger is simple and sleek, being just a plastic housing for a wifi unit and battery, the MP-360 looks a little ungainly at first, particularly once all the cables are attached. The camera itself attaches directly to a 3/4 inch screw on a tilting platform that has studded rubber as a base to lock the camera against. A simple plastic wheel underneath the base rotates the screw to attach the camera to the unit. The unit then revolves around a swivel motor at the base. For the most part the swivel seems to be of decent construction. There is very little play on the housing when everything is set up. Not so the Tilt base sadly. The plastic struts, although quite thick look a little flimsy when a big pro body camera like a D3x is attached. The other concern in relation to the tilt base is that the motor gears seem a little weaker than the swivel gears, meaning that there is a bit of play in the tilt control when set up. The concern regarding play in the different axis is that any inadvertent bumping between frames (or worse, during the actual frame exposure) translates into juddering in the final time-lapse clip. This is particularly evident if the wind is gusting. It doesn’t matter how stable your tripod is if the actual panoramic head jiggles slightly in the wind. A useful feature on the MP-360 is the level. Without this it would be quite difficult to get everything set up for a decent level pan. Even with this, I still found that I would have to try and get the tripod ballhead as level as possible before adding the MP-360. I used the Sirui K-40x exclusively for this purpose as I was also testing this head at the same time. It is possible to mount the MP-360 directly to the tripod, but this isn’t ideal as getting the tripod legs level can be arduous at times. It’s far easier simply adjusting the ballhead and then attaching the MP-360. Unlike some other panoramic heads on the market, the MP-360 also takes AA batteries! This is a plus. Sure, four AAs isn’t going to give you the same amount of juice as a lithium-ion pack, but they are available virtually anywhere in the world, are easily rechargeable if you have the NiMH type, don’t cost a fortune and essentially are future proof since the AA battery isn’t about to disappear because of a new model that requires a new type of battery (ala virtually every second generation of digital camera). The CamRanger wifi unit is different in that it requires it’s own little lithium-ion battery. You also need to charge this battery with the actual CamRanger unit, so you can’t charge and shoot at the same time. Incidentally, I found that the battery indicators for the CamRanger unit and MP-360, which are both found on the app (although confusingly look identical), are relatively accurate. A few more bars - there are only four - would be nice so that a more accurate estimate of shooting time can be gauged. I managed to download the CamRanger app without any hassles from the App Store. On setting up you need to register the device to the app. Occasionally the unit seems to forget the registration and you have to do it all over again. This is a pain in the behind when you are in the middle of a time-lapse sequence and the app and the CamRanger don’t want to talk to each other. Once it is all set up though, the app is very easy to use. Using an iPad you get plenty of real estate to view the controls, various settings and the thumbnails of the images themselves. Once the time-lapse starts a countdown panel appears, thumbnails start to populate the top row and a cancel button pops up. Issues that I came across were the limited range of the wifi, and downloading an actual preview. On more than one occasion, if I wandered too far away from the camera rig the connection would break and I would just get the dreaded revolving circle indicating that the app was ‘thinking’. The good news is that this doesn’t stop the time-lapse from shooting. The camera and CamRanger just keep on going with the settings that you input, but you no longer get to adjust on the fly or see the thumbnails as the sequence continues. Another thing about the app is that it didn’t seem to like the phone accepting actual phone calls. Although the sequence continued, when I received a call during a shoot, the app crashed and I had to reboot and re-input the PIN code to get everything working again. Moral of the story: don’t take calls while waiting for time-lapse unless it’s on a different phone. I usually set up all the cables as a bunch and packed them into the bag ready to use before setting out on the shoot. This makes it simple to setup once in the field. 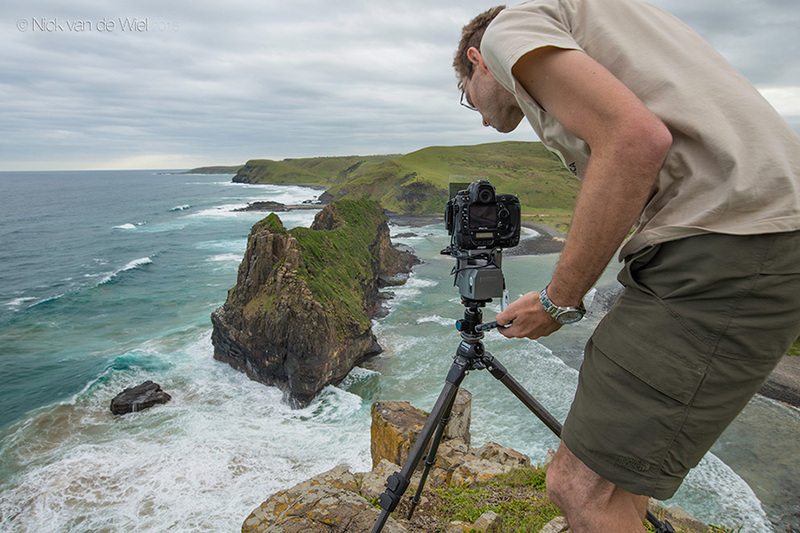 Step one is to pre-visualise your sequence and get the tripod into the right place. Once everything is levelled you can get the MP-360 onto the tripod and attach the camera with the plethora of cables. Next, boot up the CamRanger and wait for the Wifi light to switch on. Go to the wifi connection on your phone or tablet and connect to the CamRanger. At this point you may have to input the code on the CamRanger itself. Once you are connected via wifi you can launch the app itself. As I discovered, it is important not to launch the app before you are connected via wifi, otherwise everything crashes and you have to restart the whole process. The first time you start up the app you will have to key in the PIN a second time. If the system freezes or crashes you’ll have to do this again, so it makes sense to have the PIN available. CamRanger have it stuck to the actual unit, but this can be tricky if you have everything setup and don’t want to jiggle the camera during a shoot and there is an issue. Now that you are connected, click through to the time-lapse feature on the app itself. Under this feature are the settings for the panoramic head as well. With the D3x I had to keep my eye on the viewfinder as I used the app’s nintendo like buttons to shift the MP-360 into its start position. With the D800 I was able to use the live-view on the app itself to frame the image. After this you can input your time-lapse settings as well as the settings for the MP-360. There are very few settings for the MP-360, but that makes it easy to get started. Essentially, you get to set the number of shots, the delay between the shots, the direction you want to have the MP-360 move (essentially left, right, up or down), the duration between the moves (calculated in milliseconds), and whether you want to do an HDR time-lapse or not. Once all this is in place, hit the start button and your time-lapse capture begins. This is the bit I really love about using the CamRanger for time-lapse: live viewing of the shots as they happen. As the time-lapse progresses a small thumbnail is sent through to the iPad or iPhone that you have the CamRanger installed on. If you take the effort to set up your camera to shoot RAW+small basic jpeg, then you can even get that image across and check the histogram (in theory - full disclosure I only thought of this after I sent the unit back to Sunshine.) I only shot RAW, so it meant I had to be happy with the small thumbnail. For me, this was enough to keep an eye on the exposure as the light changed and be able to adjust on the fly. The beauty of this is you can have two different time-lapses up and running, but only be sitting close to one of them. Via the app you can start, stop and adjust the exposure of your frames from about 20metres distance. The important part of this is that you can adjust the settings of the camera without physically touching the camera. This is a biggie as any movement on the camera will result in a jittering in the final time-lapse clip. I found a movement of between 30 to 40 milliseconds ideal for most pans, taking about an hour to do roughly 180 degrees of movement with frames every 3-4 seconds. If you are using particularly long exposures, like for stars, you might want to have a little more movement between the frames. As it is I also found that tilt required more movement than pan, so the final clip in the companion video had a move duration of 50 milliseconds, whereas the usual left and right pans were 30 or 35 milliseconds. Once everything has been shot I then head back, ingest the RAW files and go through the Lightroom and LRTimelapse workflow. Final clips are then spliced together into a narrative flow using Premiere Pro. 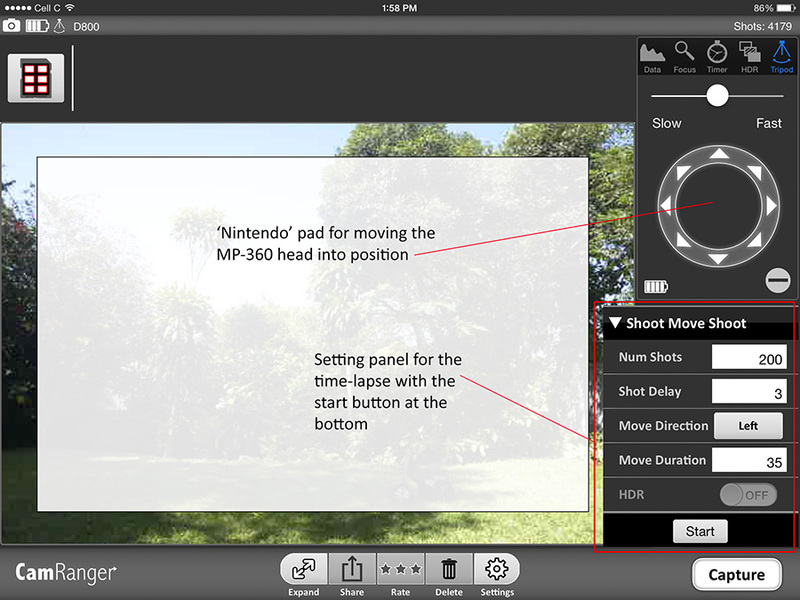 You can use any video editor once you have assembled the time-lapse clips. iMovie is a nice free option for Mac users, but there are others out there as well. Or should I say jiggles. The CamRanger itself works well, but not flawlessly as a time-lapse controller. I love the visual confirmation while shooting, and for me that sort of is enough to make up for the issues. The issues being, connection breakages. If you move too far away from the CamRanger or you try to download a RAW file onto your iPad/iPhone while shooting, all manner of photographic hell breaks loose. Basically CamRanger freezes and you have to reboot the unit. This means severing the wifi connection and inputting your PIN all over again. This is not cool if you are in the middle of the time-lapse sequence. The good news is that the CamRanger doesn’t actually stop shooting, it will just continue with the current settings. You just lose visual confirmation or the ability to stop, start and change settings from the app (you’ll have to reboot to do that). I have two niggles with the MP-360 head. One, the gearing is just not stiff enough to handle modest wind conditions and two, 30 degrees of tilt is really not enough. I also wonder why we can’t have diagonal movement. If you watch the companion video of this review you will notice that there is a certain jerkiness to some of the pans. This was due to wind that buffeted the rig slightly. The last two pans on the video, of the stars, were shot in windless, still conditions and the results are smooth jiggle-free pans. To be fair, I did most of my time-lapse shooting with a Nikon d3x and prime lens (occasionally with a Lee filter setup on the front). This is not a light rig. The pans were smoother when I used a D800 which is somewhat lighter than the D3x. I was also shooting along the Wild Coast, which is known for it’s blustery winds. I need to point out that this is not a comprehensive review of the CamRanger. The CamRanger is massively competent and can be added to an amazing array of applications. After having used the CamRanger for a little over a month, I want one. Not just for time-lapse but for various other applications. Creating composite images with different lighting patterns for architectural and industrial imagery is one area I know I would use it (Cape Town based photographer Chris Cloete had reviewed the CamRanger for just this purpose on this link: https://www.ormsdirect.co.za/blog/2015/02/19/using-camranger-photographer-chris-cloete/). Another is wirelessly tethered shooting as Ben von Wong pointed out in his review and tutorial (http://www.vonwong.com/blog/wirelesslightroomtether/). However, the scope of this essay is purely the time-lapse abilities of the CamRanger and the CamRanger PT-Hub & MP-360 kit. Both the CamRanger and the MP-360 were not exactly designed for time-lapse photography. But they have been press-ganged into the service thereof. Considering their purposes are for more than time-lapse footage they do a pretty good job. In fact the CamRanger is a fantastic time-lapse tool. The ability to monitor the sequence from a slightly remote position as well as the ability to make changes without touching the camera make it a fantastic time-lapse tool. It is expensive, but I heartily recommend it. The other huge bonus to having a CamRanger is the myriad other uses it can be put to. The MP-360 is a trickier beast to deal with. When it performs well, it does so beautifully. However, the jerky nature of some of the footage I captured shows it’s weak point as well. It is theoretically possible to smooth this movement out using software such as Adobe After Effects. I personally haven’t tried this, but intend to in future and will update this review once I have done so. It’s actually fairly simple to get the MP-360 and PT-Hub set up. Readers might get the impression from the above review that it is overly complex, but the reality is that time-lapse setups using dollies and heads is extraordinarily complex. No matter which system you opt for, you are going to have to work your way through labyrinthine manuals and miles of cabling. To that end, the CamRanger and MP-360 is actually pretty simple and straightforward. In the right conditions it can also produce good to excellent results. If you need the MP-360 for purposes other than time-lapse photography, then it’s a fantastic addition to your kit with the added bonus of introducing perspectival movement to your time-lapse clips. If you are looking for a dedicated time-lapse head though, then I suspect that the MP-360 leaves a little to be desired for the time being. Certainly on it’s side is the fact that it is cheaper, and easier to use than a significant portion of the competition. The takeaway from this is that the CamRanger unit is brilliant for time-lapse capture. Buy it, use it, you’ll love it. The MP-360 needs some work still to be made perfect. It probably excels for remote wildlife photography and for some remote video usage. The movement needs to be smoothed out a little bit before I could without reservation recommend the MP-360 as a time-lapse head. Still, it’s more than useable and an excellent entry-level robotic head.